Toes Are Not For Tasting! I get a pedicure once in a blue moon. Since we had a beach trip last week, the moon was blue. Suddenly my peachy (and pudgy) toes looked like a delightful snack to Daisy. 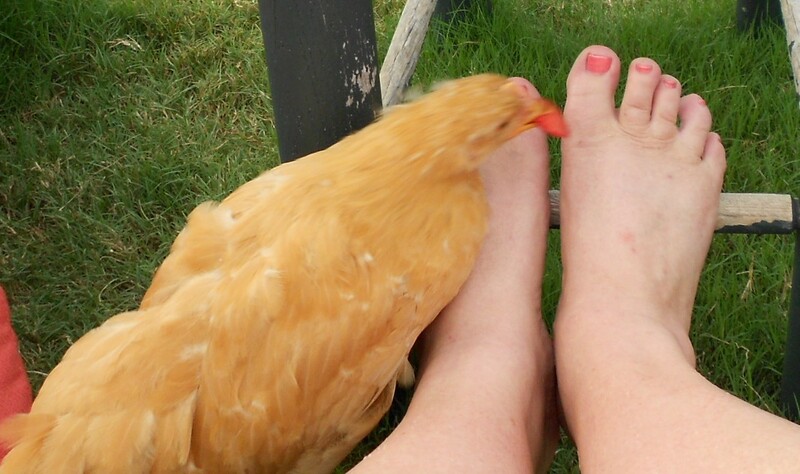 Heretofore she had never pecked at my toes. This is perhaps due to the fact that they are rarely appetizing. (usually covered in grass and dirt since I enjoy being barefoot in my back yard) The day of my visit to The Nail Palace she went wild for my tootsies and I was tempted to put on shoes. (gasp!) I had a small bowl of strawberries cut up to hand-feed the girls so I did the only logical thing I could think of. I put a strawberry slice on my big toenail and attempted to take a picture of Daisy grabbing it with her beak. I can’t believe I got this photo. Later, Violet gave chase and Daisy eluded her. A tastier “toenail” was never enjoyed by a chicken. We had some more neighbors visit last week with their toddlers. Knox and Josie were delighted with my chickens and Knox was making plans to move in to the coop for the night. He used to pass my house with his dad in the golf cart and squeal, “That’s the bunny house!” I’ll bet Old MacDonald didn’t have super cute toenails. Daisy is so grown up! Looks like a young “chica ” rather than a little chick. What a beautiful girl! I am hoping to see them before my summer is all gone. Isn’t she beautiful. 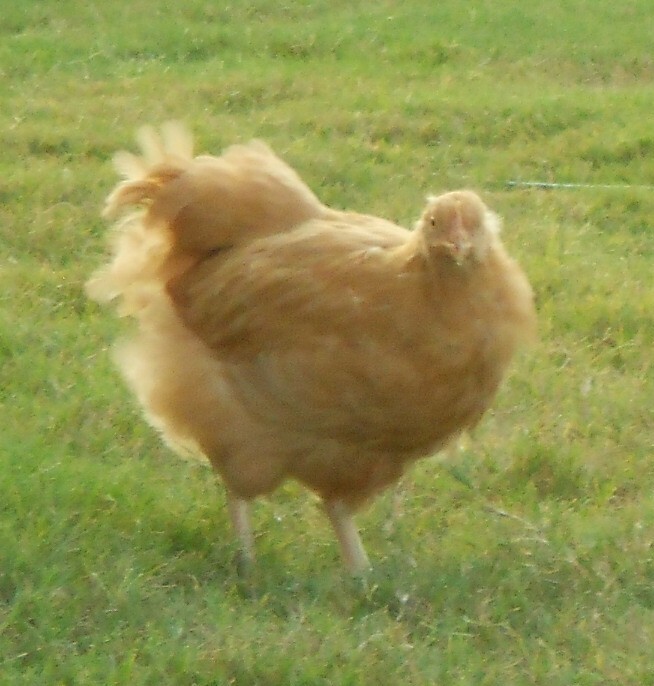 She’s the “Doris Day” of the chicken world. Wholesome, blonde, with America’s sweetheart looks. She keeps asking when Aunt Marcia will visit! Oh, and Violet is Ava Gardener (smokey, dark and mysterious) and Rosie is a cross between Phyllis Diller and Lucille Ball!